The Democratic Party of Virginia is going back to basics in its attempts to hold Virginia Attorney General Ken Cuccinelli accountable for gifts received from a technology company CEO. In order to remind voters about the gifts, the group has bought advertising on a digital billboard alongside I-195 in Richmond urging Cuccinelli to reimburse Star Scientific CEO Jonnie Williams for the $18,000 in gifts he received from him. 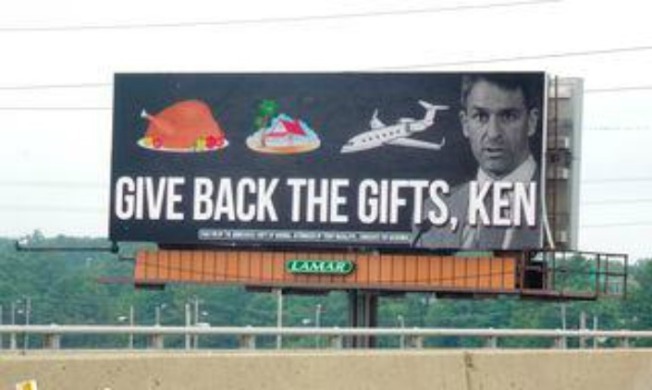 The billboard shows pictures of a turkey, island home and jet, all of which are gifts given to Cuccinelli by Williams. The phrase “Give back the gifts, Ken” is written in large white letters under the pictures. Democrats have been trying to get Cuccinelli to either return the gifts or pay back their equivalent value, citing Gov. Bob McDonnell’s efforts to return gifts given to him by Williams. Cuccinelli has refused to return the gifts on multiple occasions. He would not even disclose all of them at first, though eventually he reported them all. He has been cleared of any wrongdoing by Richmond Commonwealth’s Attorney Michael Herring. “If Ken Cuccinelli won’t come clean and reimburse the value of the scandal gifts, then he should have to explain why not to the people of Virginia, including the Richmond commuters who see his face on a billboard on their way to work every day,” said Democratic Party spokesperson Brian Coy to NBC12. Coy said the billboard will stay up for a week unless Cuccinelli changes his mind and decides to reimburse Williams.